In the early nineteenth century, Tobias Herondale abandoned his fellow Shadowhunters in the heat of battle and left them to die. His life was forfeit, but Tobias never returned, and the Clave claimed his wife’s life in exchange for Tobias’s. Simon and his fellow students are shocked to learn of this brutality, especially when it is revealed the woman was pregnant. 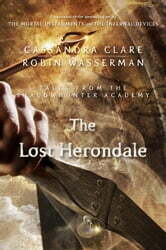 But what if the child survived … could there be a lost Herondale line out in the world today? Amazing. Couldn't stop reading the whole way through to the chagrin of my girlfriend. My only criticism is that it was too short but that may have saved my skin... Keep up the great work. Finally, Simon is getting the attention he deserves. He is my favorite person in all this Shadow hunting business. Looking forward to the 3rd episode. Much better than the first book. I enjoyed this book tremendously. Will definetly buy the rest of the books as im too curious to see what will the stories entail. Loved the Mortal Instrument series, and not ready for it to be over? Follow Simon as he journeys through Shadowhunter Academy and learns the worst crime a Shadowhunter can commit - desertion of their comrades!